This toy looks so cool. It’s just the kind of “creative” toy that my mom would have gotten for me as a kid. I wonder how I missed out on it. 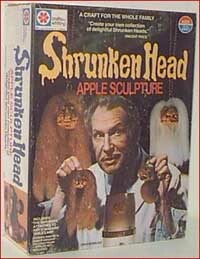 Of course, you will want your shrunken head to be gory and ugly. The Vincent Price set used a series of vinegar dips to give the shrunken head a more leathery and preserved feel, so you might want to substitute vinegar during step six. Don’t forget to sew the lips shut! Good Luck and Happy Shrinking!